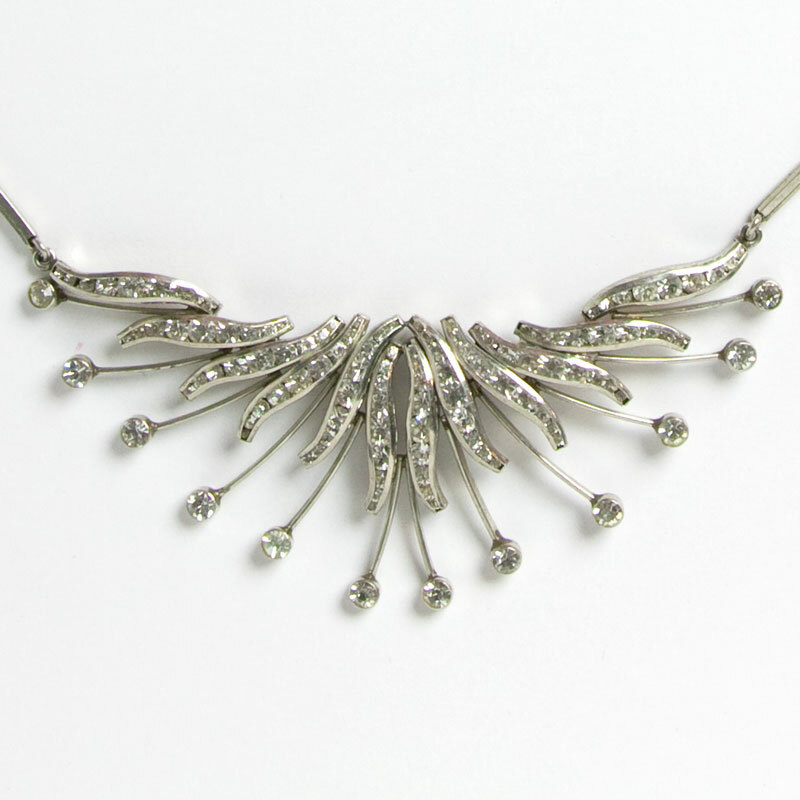 This vintage bib necklace has a 3 ½”-wide centerpiece of tapered, curved links of channel-set diamanté and sprays of single stones. The setting is rhodium-plated white metal. An adjustable bar link chain with a spring-ring clasp completes the piece. This type of adjustable clasp – instead of the North American-style J-hook – was used by many German jewelry makers in the 1950s. 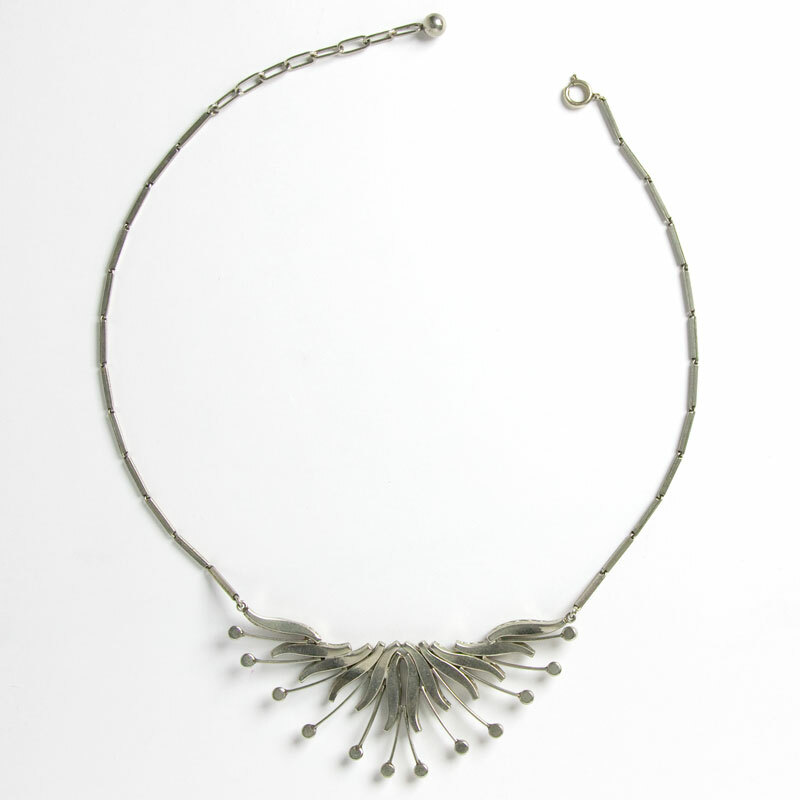 The design and construction of this piece remind me of the work of Schreiber & Hiller, but this necklace is unmarked. Nonetheless, I think it was German-made. A perfect jewel for a woman who looks best in cool colors! Scroll down to see some coordinating bracelets. 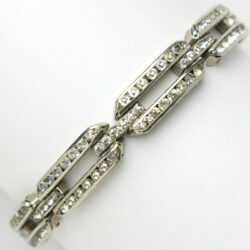 This German bracelet features four rows of slightly curved, tapered links channel-set with diamanté. The rhodium-plated setting closes with a concealed clasp and safety catch. 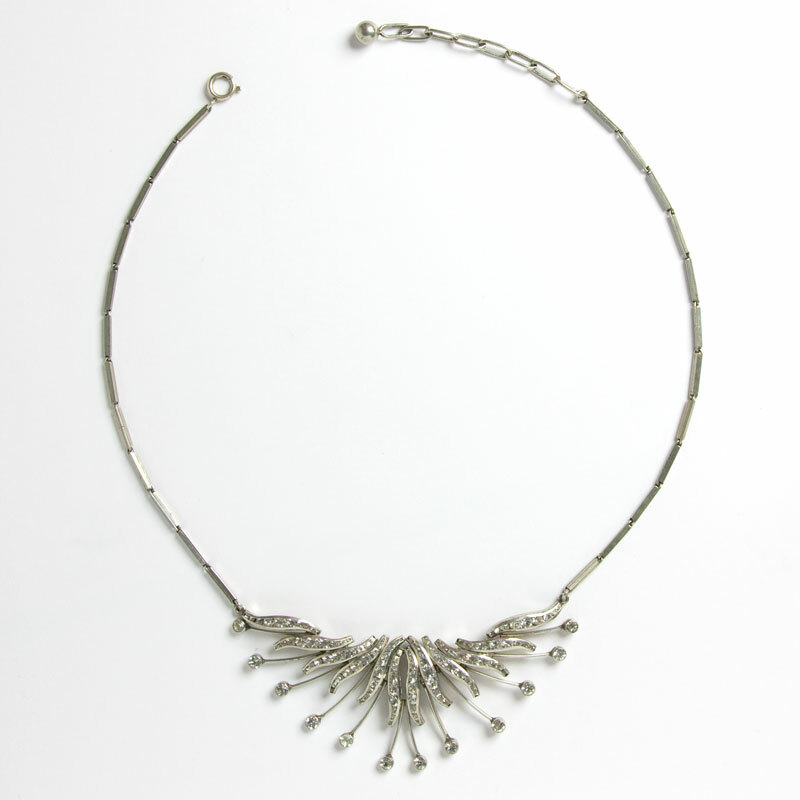 Although this piece is unsigned, the tank-track pattern and the bracelet’s construction remind me of pieces made by German companies in the 1930s. This bracelet may have been made in the early 1950s, when the German companies were re-establishing themselves after the war. This bracelet was made for a slim wrist. Please note its length (6 7/8") and measure your wrist before purchasing this piece. Scroll down to see coordinating pieces. 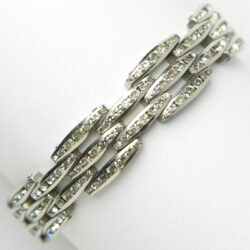 This chevron link bracelet has diamanté channel-set in tapered, curved links. This pattern is quintessential Art Deco. The rhodium-plated setting closes with a concealed clasp and safety catch. 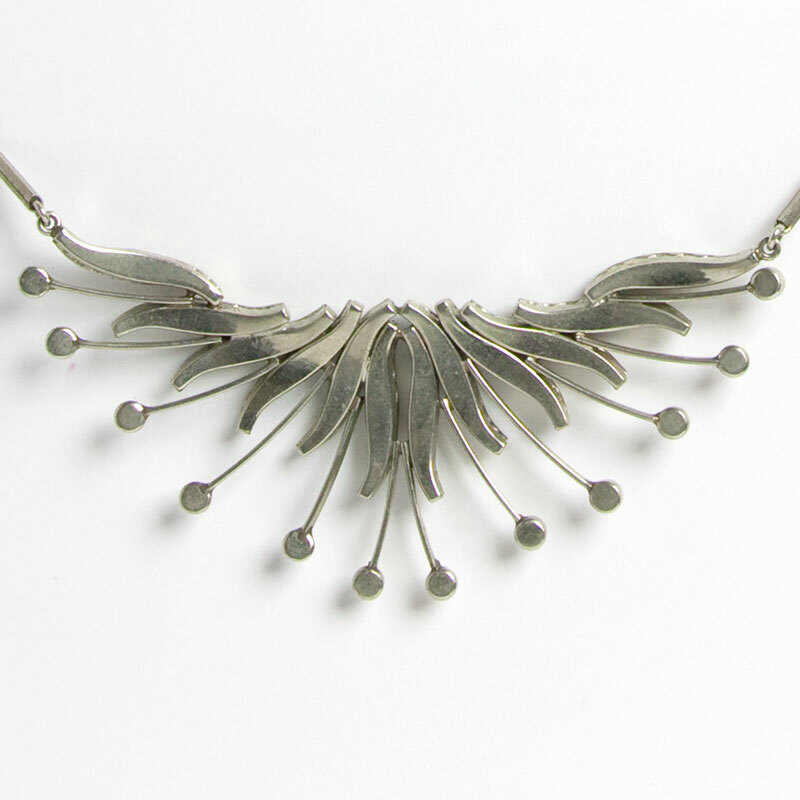 The design and construction of this piece remind me of the work of German makers in the 1930s. Although this jewel is unsigned, I think it is one of their creations. This bracelet was made for a slim wrist. Please note its length (6 7/8") and measure your wrist before purchasing this piece. Scroll down to see complementary pieces. 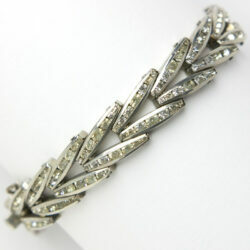 This diamanté silver bracelet has two rows of long, slender, slightly-curved links of channel-set stones. Each link is trapezoid in shape. 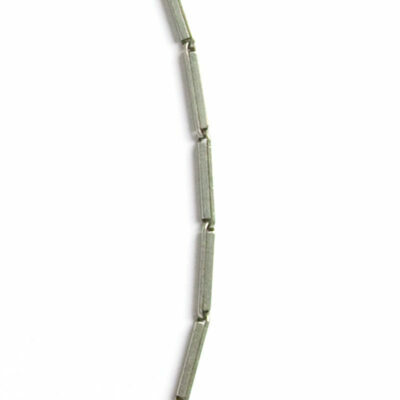 A single row of slimmer, short, pointed-top connecting links is in the middle. 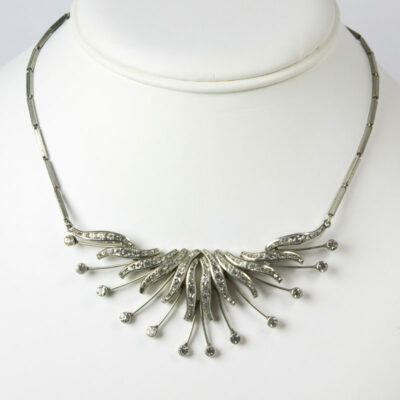 The setting is rhodium-plated white metal. This bracelet closes with a concealed clasp and safety chain. This piece is unsigned, but it reminds me of the work of the German company Schreiber & Hiller. I think this bracelet was made in the 1930s, but it could have been made around 1950, when German companies were re-emerging after the war. Scroll down to see some complementary pieces.